General Conditions General Conditions apply to all sections in the competitions unless stated otherwise. Special Conditions for specific sections appear under the appropriate section in the Competition Schedule. To the extent of any inconsistency Special Conditions will take precedence over General Conditions. ‘The Board’ refers to The Royal South Street Society board of Directors. 1. A competitor performs an item in a section within a discipline (E.g. Classical Vocal). A section may be split into divisions if a high volume of entries are received. COMPETITOR - A competitor may be one person, or any group of two or more people. Each group competing in a section must comprise completely different competitors, unless stated otherwise in the Special Conditions. ONE ENTRY - Only one entry is allowed from each competitor in each section, unless stated otherwise in the Special Conditions. Competitors who have been taught by the adjudicator of their section within the last 12 months are ineligible to enter. 2.1 AGE LIMIT – Herald Sun Aria – Competitors must be at least 17 and not over 35 years on 31 December of the current year. Calisthenic Sections – The competitors age on 31 December of the current year. Dance Sections – The competitors age on 31st December of the preceding year All Other Sections - The competitor's age on 1 January of the current year, shall be deemed the age required in the sections specifying age limits. 2.2 ENTRY DATE – Entries must be submitted via our ONLINE competition database on or before Friday 26th April. Calisthenics entries to be lodged before Friday 5 th April. Herald Sun Aria entries to be lodged before Friday 28 th June. All entries must comply with the general competition rules at the time of entry. A confirmation will be generated for the competitor and it is the competitor’s responsibility to confirm all details of the entry are correct. There are no refunds for cancellations after the closing date. Should alterations be required, a request via email to info@royalsouthstreet.com.au must be forwarded to the Society. Responsibility for correct entry rests with the entrant. The eisteddfod cannot be responsible for entries lost through failed electronic transmission or incorrectly submitted online via our stardom entry system. Check your junk mail if you don’t receive a confirmation email. LATE ENTRIES will NOT be accepted past the due date for the 2019 competitions. Due to Royal South Street Society using an ONLINE competition entry system, we are unable to process or receive entries after the due date. Exceptional circumstances via email to info@royalsouthstreet.com.au may be considered however will be subject to additional late fees. Late entries are only accepted subject to our final timetabling capacity and program deadlines without obligation. We reserve the right to not print late entries in the guide book, however all entries will be announced by the MC on the day. ENTRY FEES - No entry will be accepted unless processed online with full payment. Entry fees are shown with discipline section items in the Competition Schedule. Fees for Calisthenics sections appear at the start of the section. Education schools may request an invoice by submitting a purchase order to admin@royalsouthstreet.com.au which must be paid within 21 days of receiving the invoice. Fees are payable to the Royal South Street Society. Fees are non-refundable once entries close, unless for an extenuating circumstance or if the section is cancelled by South Street. COMPETITORS NAMES - All competitors must submit with their ONLINE entry correct names, dates of birth and addresses. No competitor will be allowed to compete under any name other than as stated in their entry. A person is only permitted to enter ONCE in the SAME event, except where otherwise allowed. NAMES OF PERSONS IN DUOS/TRIOS - In all items where two or three persons are competing, the name of each person must be given at the time of entry in order for the entry to be accepted and processed correctly online. NON-ACCEPTANCE - The board reserves the right to refuse any entry. MINIMUM/MAXIMUM - The board or section representative may at its discretion cancel, combine or divide any section/s that have 3 or less entries at the time of entries closing. Refunds will be given when a section is cancelled. NAMES OF COMPETITORS IN GROUPS - In all group items, a list of the names of all people appearing in each item must be held by the school representative. A separate list for each item must be supplied to comply with Occupational Health and Safety requirements. COPYRIGHT â&#x20AC;&#x201C; I/we declare that all necessary licences for copyright have been obtained and only originals or licensed copies will be used in accordance with copyright laws and agreements. PHOTOGRAPHY & RECORDING – I/we acknowledge the Royal South Street Eisteddfod reserves the right to record, film, broadcast, telecast, live stream, videotape or photograph any entrant, item or event in the eisteddfod without notification. Any such photograph, recording or broadcast may be used at the eisteddfod’s discretion for publicity or promotional purposes, including competition results, photos via electronic and printed media at our discretion but shall not necessarily constitute an endorsement of any participants, and no remuneration or compensation whatsoever shall be attributable to any participants so featured. I/we agree to Royal South Street appointing official photographers and videographers to record/photograph/ live stream any/all of my/group performance during the competition these photographs and videos can be retained, broadcast, telecast by Royal South Street for marketing, publicity and archival purposes, by submitting your entry you have automatically granted permission for this. Copies of photographs and videos will be made available to competitors/groups to purchase through the officially appointed photographers. All photos will be accessible via the official photographer’s online shop using individual discipline access codes. If for any reason you do not wish to have your individual/group performance photographed or recorded it is your responsibility to submit an official request in writing (annually) to the Royal South Street office advising your objection by no later than 14 days prior to the performance date. Individuals/ teams may only be exempt from live streaming in the case of exceptional circumstances such as legal issues it is your responsibility to submit an official request in writing (annually) to the Royal South Street office advising your objection by no later than 14 days prior to the performance date. This email must be sent to info@royalsouthstreet.com.au and include the date, section number and performance number of the item. CONDITIONS – Competitors/guardians acknowledge that I/we have read and agree to abide by the “General Conditions of Competition”, and where relevant “Theatre Rules” and “Special Conditions of Competition”. Competitors/guardians acknowledge that failure to comply with any of the foregoing rules and conditions may result in disqualification, the withholding of prizes, and a future bar in competition. The decision of the Board or relevant discipline committees in all questions or disputes arising out of or not provided for, by these rules and regulations will be final. All entries are received according to this condition and in the spirit of friendly competition upon which the eisteddfod is based; accordingly no dispute shall become the subject of any appeal at law. ASSISTANTS - The board reserves the right to appoint a co-adjudicator, or assistant, or substitute adjudicator when necessary. COMMUNICATION - Any unwarranted communication with the adjudicators, either by competitors, teachers, parents or other interested parties during the competitions is prohibited. Prohibited contact includes verbal, email, SMS or social mediums such as Facebook, Twitter, Internet, and Blogs or through any third party. Discipline Chairs or their delegates from their sub-committee may approach the Adjudicators when and if required to do. CRITIQUE - A detailed critique by the adjudicator will be provided for competitors in each section. It may be obtained at the RSSS office at the end of each section, except Calisthenics where critiques will be available at the end of the division and will only be given to coaches. PRIZE - The adjudicator has the right to withhold any prize. In the event of a tie for first in any section the first and second prize shall be divided equally between the tied competitors and no second will be awarded. The competitor with the next highest points will be awarded third. In the event of a tie for second prize, the second and third prize shall be equally divided between the tied competitors and no third will be awarded. When awarding an Honourable Mention or Highly Commended these achievements are to be considered fourth and fifth place respectively. SOUND LEVEL - The adjudicator has the right to control the level of any amplified sound in the auditorium. ORDER OF COMPETING - Competitors must compete in the order in which their names appear in the program unless officially authorised or directed otherwise. If not present when called upon, competitors are liable for disqualification. PROOF OF AGE - In any section where an age limit is specified, the board reserves the right to ask any competitor, at any time, to provide a proof of age. Any prize money may be withheld until such proof has been provided. PERSONAL PRESENTATION - The board expects behaviour of competitors and audience to be appropriate to the occasion, Inappropriate language and movements are not appreciated except for Speech & Drama where applicable. Offenders may be removed from the theatre. All competitors are requested to dress neatly and present well on stage. Performances should be appropriate to the competitorsâ&#x20AC;&#x2122; age and to conservative community values. Inappropriate language and movements are not appreciated. REHEARSAL - No rehearsal or practice is permitted on the stage to be used for the competitions during the currency of the discipline for which the competitor is entered. Any competitor not observing this condition may be disqualified. Dancing championship sections and Calisthenics Free Exercises are exempt. WITHDRAWALS – Competitors who do not intend to compete in a section for which they have entered should as a courtesy notify the office to that effect 24 hours before the time appointed for that particular section. CAMERAS, VIDEOS RECORDERS, AND MOBILE DEVICES. - The use of these by members of the audience during the competitions is strictly prohibited during items or when stage lights are down. Mobile Devices must be turned to silent while in the auditorium. Offenders may be removed from the auditorium and recording destroyed. Performances are copyright. Performances may be photographed and recorded by official photographers/ videographers Teachers, coaches, competitors, parents or representatives are strictly prohibited from filming recording or taking photography of any performance. Privacy and legal consent must be respected at all times. Lights of any form including light up pens and mobile phone torches must not be used during a performance. PROTESTS - To be made in writing, within one hour of the disputed competition, and to be accompanied by a $25 deposit, this will be forfeited if the protest is deemed frivolous. Calisthenics excluded see ACF rules 1.6. STAGE – The stage plan for Her Majesty’s Theatre is located on the RSSS website on the competition page. PRIZE MONEY/MEDALS - Prize money and medals for solo, duo or trio items may be obtained at the RSSS office immediately after the awards are announced or in some cases may be presented on stage. Certificates may be purchased at the office. TIES - In the event of a tie for first prize in any section the first and second prize money shall be divided equally between the tied competitors. The competitor with the next highest points will be awarded third prize and no second will be awarded. In the event of a tie for second prize, the second and third prize money shall be equally divided between the tied competitors and no third will be awarded. AGGREGATE PRIZES - Aggregates are determined by adding points assigned to first, second and third places won in the various sections specified. Points are assigned thus - First, 5 points; Second, 3 points; Third, 1 point. Calisthenic and dancing sections use a different scoring method. Full aggregate points to be allocated in the event of a tie. E.g. Equal first 5 points each. Calisthenic and dancing sections use a different scoring method. Calisthenics is exempt. AGGREGATE TIE - Where a tie for an aggregate occurs, reassessment is made thus greatest number of firsts to decide winner. If first are equal, then greatest number of seconds decides the winner. If a tie still exists, any prize money will be divided as in prize ties 6.2. Calisthenics section is exempt. 6.5 PERPETUAL TROPHIES - Will be held by the winner for 11 months. It is an expectation that all perpetual trophies MUST be returned to the RSSS after 11 months. All holders of trophies will be held responsible for their safe custody, engraving and return at their own expense. All trophies must be returned in the same condition they were received. 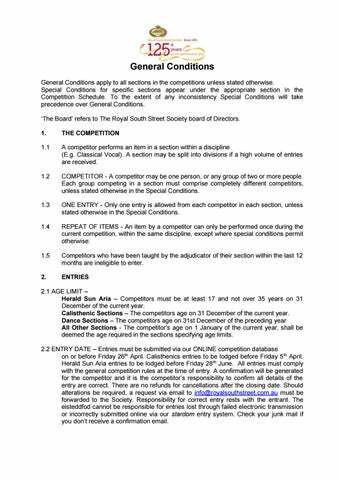 6.7 CRIT ONLY – RSSS OR Discipline Chairs reserves the right to allow an item to perform for crit only in the event there are insufficient entries to meet our minimum requirements to run a section with prize money, or there is deemed to be a conflict of interest as determined by the RSSS board, section chair or adjudicator. 7. FINAL DECISION - The decision of the board in all questions and unresolved disputes arising out of, or not provided for, by these conditions, shall be final. RECORDING - Refer General Rule 2.10, C.
RISK - Competitors acknowledge that they compete at their own risk. Performances should be designed to be safe for the performer, audience and theatre. Any ‘unusual’ items should be discussed with RSSS and the theatre technician first. The theatre technician and stage manager may prevent a planned performance if in their opinion technical safety is inadequate. Risk assessment forms (JSEA) are required for any performances using props that have ANY risk associated with their use including things such as balls, ladders, or wheeled items for example. Forms are available from our website and should be submitted at/by the deadline list on our website which is at least two weeks prior to commencement of the discipline. Please contact the RSSS office if you are unsure. The theatre technician, stage manager or adjudicator has the right to stop any item if they are of the opinion a competitor has suffered a serious injury, or there is a possible risk of serious injury. Items so stopped (8.4, 8.5) may be repeated and adjudicated normally, at an appropriate time, subject to the opinion of the adjudicator and stage manager on the nature of the danger. Calisthenics: See safety requirement ACF Rules 1.1.k viii & ix. Minor accidents which occur due to faulty property, choreography, or costume design, are not necessarily a reason for such a stop and restart of an item. Only the ultimate safety of the competitor is to be considered. All patrons must observe directions or commands given by theatre personnel, Royal South Street Society Staff and Volunteers. In the event of evacuation of the theatre, patrons should comply with directions from Theatre staff and Royal South Street Society Staff & Trained Ushers.